My Favorite Pony Is: Applejack!!! 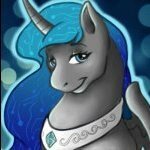 I have been a Pegasister/Brony for about two years now. It didn't take long for me to catch up with all of the episodes.